2014 a great year for BBRY | BlackBerry Blast! BlackBerry outperformed most of its tech rivals even though the company endured loads of negative stories throughout the year. BBRY is up about 48% over the past year. That's better than Apple, Microsoft, Samsung, and many more. How can that be? BlackBerry apparently has a solid set of bullish investors who believe in CEO John Chen's turnaround strategy. Even though their market share is small, they are turning the company around. Can this trend last? 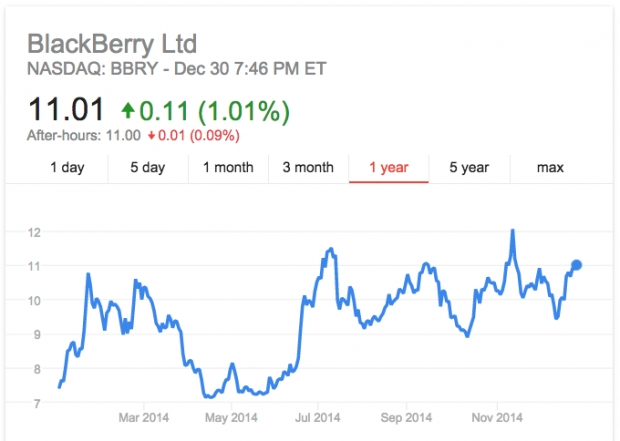 Only time will tell, but if you were lucky enough to purchase BBRY at the beginning of 2014, you made out pretty well. 2015 will very likely bring better quarterly results for BlackBerry, but will the stock continue to rise? BBRY is near $11 and that seems awfully high for where the company has been. Could it be higher at the end of 2015? I'll bet it is.